Experimental band STOLEN BABIES fuse avant-garde-twisted rock, metal, punk, and theatrical influences with the peculiar image of what (to an unprepared onlooker) may seem like an eccentric Tim Burton-themed after-hours club house band on happy pills. The amalgamation of these visuals with their unforgettable music have solidified STOLEN BABIES’ place in the world of aggressive rock – landing them on tours with internationally recognized groups such as STONE SOUR, LACUNA COIL and SEVENDUST, as well as equally unconventional yet acclaimed artists like DEVIN TOWNSEND and OTEP. While the band’s recent (and exhaustive) touring schedule has been nothing but impressive as of now, STOLEN BABIES have consistently been the square peg presented with a round hole to fill. The band is pleased to announce that with their upcoming July 2014 tour, not only will the square fit snugly in its place – longtime fans will feel right at home. STOLEN BABIES are set to open for a stellar line up of not only fellow special guests HATE ETERNAL, but esteemed headliners GOBLIN. GOBLIN is the progressive rock group featuring keyboardist and celebrated horror film composer Claudio Simonetti, who is widely recognized for his work with cult classic Dawn Of The Dead, amongst several other films. 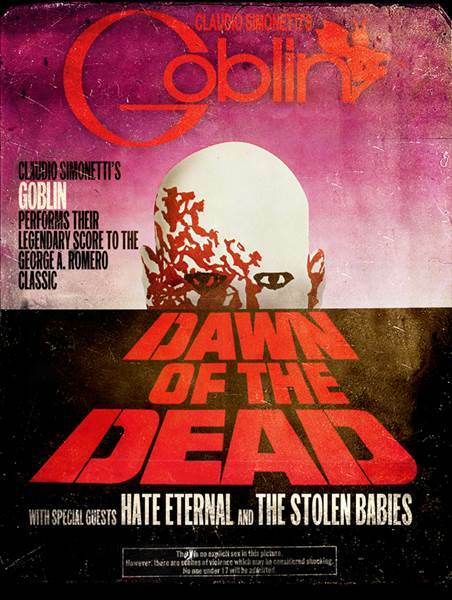 For this tour, GOBLIN will perform the entire legendary Dawn Of The Dead score each night. Yes, the square peg is fitting nicely.